The surprise election of Donald Trump has created uncertainty in the healthcare Industry. His promise to “repeal and replace Obamacare” (also referred to as The Patient Protection and Affordable Care Act or ACA) has the attention of healthcare providers and healthcare real estate investors alike. Details of what a replacement plan might entail are just now emerging, and it has been suggested that while repeal may come quickly it will be delayed until a replacement plan has been readied. At this point in time, a full repeal without replacement appears impracticable. Repeal could leave as many as 21 million Americans uninsured. House leader Paul Ryan has advanced his own plan, as has Tom Price, the just confirmed head of the Health and Human Services department (HHS). It is not clear that either plan is supported by the President or by a majority of members in congress. Already, the President has indicated an interest in preserving the availability of insurance for those with pre-existing conditions and for young adults so that they can remain on their parents’ insurance until the age of 26. A myriad of additional proposals have been put forth by other parties involved in the debate. As things stand, it appears that the most likely outcome for a new healthcare plan will be to retain some of Obamacare’s most popular provisions while trying to integrate market based competition to reduce the cost of insurance. Regardless of the outcome, the favorable drivers for investment in the medical office and outpatient sector remain compelling. The greying of America, innovation in medical technology, and the drive to the lowest cost setting are all fueling the demand for healthcare services and the modern space necessary to deliver care. 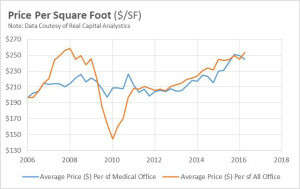 The result has been that, as of the end of 2016, the average capitalization rate for medical office buildings stood at 6.7% according to Real Capital Analytics, and prices per square foot were nearing an all-time high. Population Prospects: The 2015 Revision. The healthcare industry has received much attention recently due to the aging “Baby Boomer” population. This group, illustrated by the bulges in the population pyramid chart, is poised to create unprecedented demand for healthcare in the approaching years. 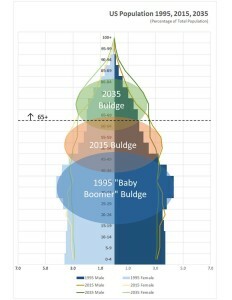 As the “bulge” ages up the pyramid, more than 21% of the population will be above the age of 65 by 2035. This changing demographic will drive increased demand for healthcare since adults over the age of 65 are more than twice as likely to visit a doctor than those below. Anticipating this new demand, healthcare systems are building new facilities to allow them to meet the aging population’s needs. Association. Special data request, 2016. 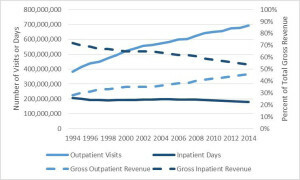 The transition of healthcare services from inpatient to outpatient has been occurring for two decades and outpatient revenues are about to surpass inpatient for the first time in history. While the industry has been growing at approximately 5.8% per year since 1999, the growth has been centered in outpatient activity as the number of inpatient days has remained relatively stable. 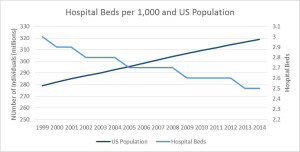 In fact, the number of hospital beds per capita has fallen by more than 16% since 1999. Source: Analysis of American Hospital Association Annual Survey data, 2014, for community hospitals. A combination of market factors has fueled healthcare’s exodus from hospitals to ambulatory settings. Outpatient facilities are not only less expensive to build than hospitals, they also have lower operating costs. Facts not lost on healthcare systems that are seeing operating margins squeezed. Furthermore, increased competition among major healthcare systems to provide a distinct patient experience has accelerated the drive to provide state-of-the-art care in conveniently located off-campus facilities. Many healthcare systems are using “hub-and-spoke” models, with outpatient facilities dispersed around key hospitals to expand their patient base and draw market share from competitors. While the debate on the ACA is likely to play out over the coming year, the factors influencing healthcare real estate will continue to drive activity. New construction is on the rise with Revista estimating 23.9 million square feet in completions for 2016 compared to 12.9 million square feet in 2015. Also, according to JLL, 83% of the $315 billion US medical office real estate market is still owned by healthcare providers providing a ready source of properties for investors should this group choose to sell them. This could come in handy as healthcare systems look for capital to fund acquisitions, IT projects, and physician recruitment. In 2015, the medical office market reached a high point in transaction activity at about $12 billion and in 2016, although down a bit at $9.2 billion, volume remained at a historically high level.